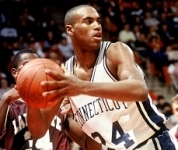 1989-90 was a landmark season for the UConn basketball program. Three seasons earlier Jim Calhoun took over a struggling program. In just his second season the Hukies won the National Invitational Tournament and following a second appearance in the NIT, Calhoun’s team had a breakout season. After finishing second in the regular season, UConn won the Big East Tournament for the first time in school history. 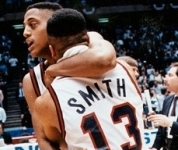 Hard to believe now, but the Huskies were a non-factor in the early years of the Big East. Now the Big East Champions were a No. 1 seed in the East. 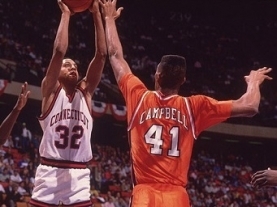 In the Sweet 16 UConn and Clemson hooked up in one of the classic tournament games.